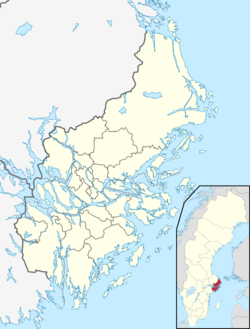 Nynäshamn is a locality and the seat of Nynäshamn Municipality, Stockholm County, Sweden with 13,510 inhabitants in 2010. While interest in the area as a potentially useful port grew from the mid 19th Century, it was only with the opening of the railway to Stockholm in 1901 that Nynäshamn started to develop. During the early 20th Century, Nynäshamn also became well known as a spa town, though most such facilities were closed down before the end of World War I. Main industries arrived through Telegrafverkets verkstäder (the factories of the Government owned telephone company) in 1916 and an oil refinery built in 1928-29 by Axel Ax:son Johnson & Co. The latter still remains though under different ownership and under the name Nynas. Nynäshamn was the venue of the Olympic sailing regatta in 1912. Nynäshamn, which lies about 60 km south of Stockholm, is well known for being one of the places on the Swedish mainland from where ferries to the island Gotland depart. This is a hugely popular destination for Swedes of all ages in the summer months. The Polferries terminal also offer regular routes to Gdańsk in Poland. Several cruise ships on tours in the Baltic Sea also stay in the harbour, because they are too large to go into Stockholm. A harbour party is hosted each summer, as well as local craft fairs. During these events a steam train often runs routes to and from Stockholm. During the summer months, the harbour is packed with boats of all sizes, and bustles with both visitors and locals. There are a number of eateries and boutiques with locally made produce. The main town is mainly modern and the buildings uninteresting generally. A library and one screen cinema is centrally located, and a limited amount of shops catering to mainly to local trade. Many people in Nynäshamn live in apartment blocks, situated in estates, although there are none more than 10 stories high. There are also plenty of villas scattered throughout the town, and terraced houses. Life in Nynäshamn is generally relaxed, in contrast to the bustle of Stockholm. The surrounding nature and sea provides plenty of photographic opportunities, once you get out of the town centre. Crime is low. Nynäshamn is served by Stockholm commuter rail (Pendeltåg) and several bus routes. Panoramic view from Nynäshamn harbour, March 2011. ^ Bo i Nynashamn "Det började för 6500 år sedan", Retrieved on 2009-04-24. ^ Website of Nynas AB, Retrieved on 2009-04-22. ^ 1912 Summer Olympics official report. pp. 224-5. Wikimedia Commons has media related to Nynäshamn. Wikimedia Commons has media related to Nynäs Offshore Race 2018.